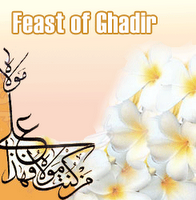 Today is the Celebration of Ghadir (Eid al-Ghadeer), based on the Islamic calendar. Its a feast celebrated by mostly the Shia Muslims. Shias are the second largest denomination of the Islamic faith after Sunnis. Shia Muslims adhere to the teachings of the Prophet Muhammad and the religious guidance of his blessed family whom they refer to as the Ahl-al-Bayt. Unlike Sunni's they emphasize more on the spiritual succession on the bloodline of the Prophet. Ghadir Khum is a very significant event in the shia calendar because according to history, it marks the day when Prophet Muhammad, upon him be peace, declared Ali as the spiritual successor. The history is recorded both in Shia and Sunni literature, but later it was downplayed by the sunni scholars. Sadly many sunnis are not even aware of this event. The even of Ghadir Khum in brief: While returning from his last sacred pilgrimage, Hajj, Prophet Muhammad, upon him be peace, received the following command of Allah: O Messenger! Convey what had been revealed to you from your Lord; if you do not do so, then [it would be as if] you have not conveyed His message [at all]. Allah will protect you from the people (5:67). Then he took Ali by the hand and declared: "Whomever's master (mawla) I am, this Ali is also his master" (Man kuntu mawlahu fa hadha Aliyun mawlahu). Then the Prophet also announced his impending death and charged the believers to remain attached to the Qur'an and Ahl al-Bayt. This summarizes the important parts of the event of Ghadir Khum. [read the full sermon from Wikipedia and also see the references below for details]. This also makes the day a day of happiness and joy for all believers because of the revealed verse that the religion Islam was made perfect on this day. It is sad that in sunni literature this very significant event has been downplayed and much misunderstanding has been allowed. We should never forget the fact that history is written by those who win the battle. Injustice has been made in the history and majority view doesn't necessarily mean true. Every story has both sides and its really not wise to ignore the other side of the coin because of ignorance. We often talk about understanding among different religions, but Muslims also need to understsand each other by learning about each other. Wish my all muslim brothers and sisters a very happy Eid al-Ghadeer.